May 11-12 – 2019 Spring Mother’s Day Weekend Wine Release – On Saturday and Sunday (May 11-12) we’re going to pamper Mom with two days of incredible experiences, exceptional wines, and lots of love! Join Tinte Cellars – William Church and Cuillin Hills wineries for a weekend of gratitude and distinctive experiences as we release our new wines and give Mom some extra special attention. Special Wine Package | We’ve created a very special wine package that includes a bottle of our NEW 2018 Tinte Cellars Viognier and a jcoco Cayenne Veracruz Orange Chocolate bar (1 oz) for $22.00; plus, the first 25 Mom’s to visit our Hollywood Hills tasting room each day will get a beautiful flower. Winery Warehouse District, 12-4pm: Complimentary numerology readings by Numerologist Lance Campbell and chair massages by Hand & Stone Massage and Facial Spa; plus we’ll have local jewelry designer Tina Negri with her beautiful all hand made one of a kind items (12-8:30pm) with 10% of all sales being donated to the Ronald McDonald House! 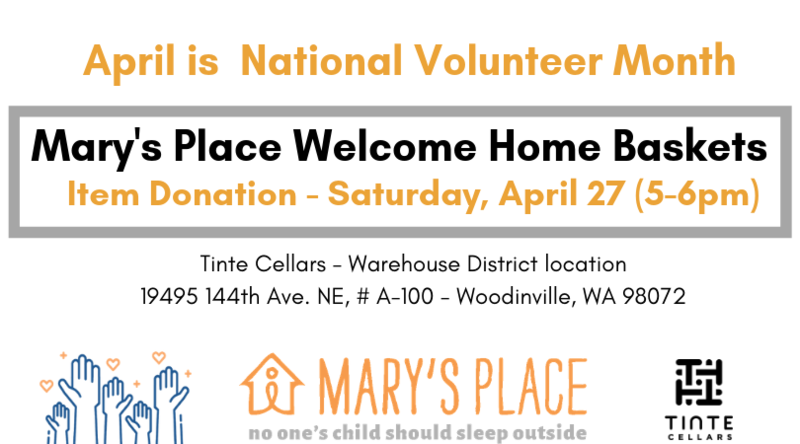 Join Tinte Cellars staff and wine club members and support Mary’s Place for families who are moving into their new homes, by providing Welcome Home Baskets with all the essentials! Sign up online to bring REQUESTED donation items, and to attend the basket making event. Come to the Tinte Cellars Warehouse Winery location at 5:00pm on Saturday April 27, along with the SPECIFIC items you signed up to bring. Help put together four welcome home baskets, including a homemade card and ribbon. Socialize with other Tinte Cellars volunteers over wine and snacks, and feel great about supporting previously homeless families! *Mary’s Place provides a welcoming and accepting environment where women, children, and families who are experiencing homelessness can find day and night shelter, nourishment, hope, and resources to help them find employment and permanent housing. Mary’s Place is there, standing in the gap, providing emergency family shelter for families who have lost their homes to stay together, tonight. And tomorrow, their housing and employment specialists will work with these families to help them find stable, permanent housing. Guests at Mary’s Place range from young adults to seniors and represent diverse backgrounds in race, ethnicity, class, sexual orientation, education, and life experience. The children they see have often witnessed or experienced violence and are often experiencing hunger, dislocation, uncertainty, anxiety, and depression. Nearly half of the mothers we see have experienced domestic violence. All of our women and families live well below the poverty line, and many struggle with disabilities and depression.